Android Pay isn’t just an NFC, tap-and-pay tool, kids. Starting today, Google says that you will start to see Android Pay buttons within your favorite apps, so that you can quickly checkout or buy goods or other items without having to pull out your credit card. All you will need to do is tap the Android Pay button, confirm your info, and then be on your way. To see how the buttons could look in an app, check out the image at the top of this post where you’ll see the option in Lyft and a couple of other apps. To kick off today’s in-app launch, some of the first adopters are offering special deals. 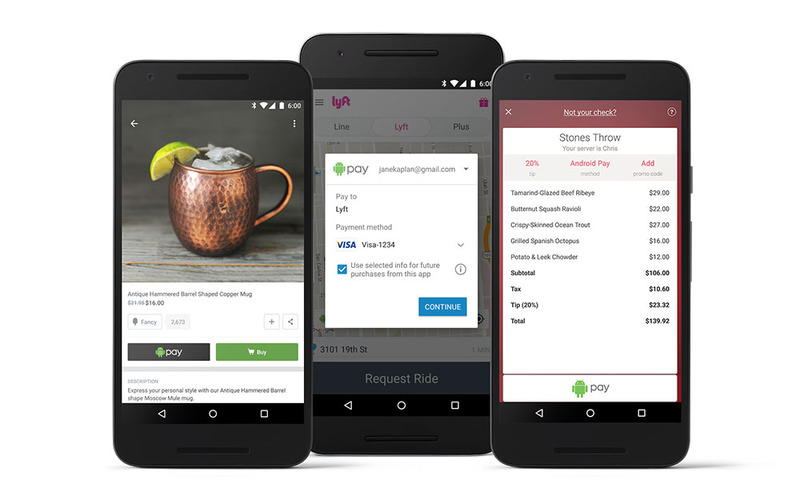 For example, Lyft will give you $10 off if you pay with Android Pay. OpenTable is slashing $20 off dining, plus DoorDash is giving you a $10 discount. There are others participating or at least who have Android Pay buttons included, all of which you can see here. On a related note for the international crew in the building, Google announced that Android Pay will come to Australia in the first half of 2016. Android Pay goes international!